I broke the news, trying to sound as casual as possible, to my wife that evening. She listened to me in chilly silence, which lasted for the following few weeks. It all sounded very reasonable, however we did not have the time available to do all the testing. It was getting warmer by the day in Dubai and we had to get on with the job before it got too hot for lifting 40+pilot. The day was set as the 10th or 11th of February. I earmarked the 10th for it as we needed the 500 every day for our passenger ride business. Mike thought that the weather may be slightly better on the 11th, however I insisted on the 10th, which turned out to be the luckiest guess I have made in a long time. The morning of the 10th was completely calm. Packed all the jumpers in (see photo) and burned and burned and burned some more. We got airborne on the upper temperature limit and things got back to fairly normal once the 10 base jumpers got out. There was a great “communal” atmosphere in the balloon. People were chatting all the way up to 8000 feet, where the 24 jumpers got ready, hanging from the edge of the basket like bunches of grapes(see photo). As planned with Mike, we got into a 1000 feet a minute descent and dropped all the parachutists at 07:16:09 local time from 6955 feet. To no one’s surprise, the balloon started climbing rather violently, reaching a maximum rate of climb of 1870 feet per minute. Also as expected, the parachute “fell in” looking very similar to a windy inflation when half of the parachute falls in. I grabbed the “candy stripe line” initially to slow down the rate of climb and it became clear within seconds that I have to keep pulling it to keep it under tension so that the whole thing does not collapse. The drama only lasted a minute or so, when it became obvious that the balloon will get through it and will be stable soon again. 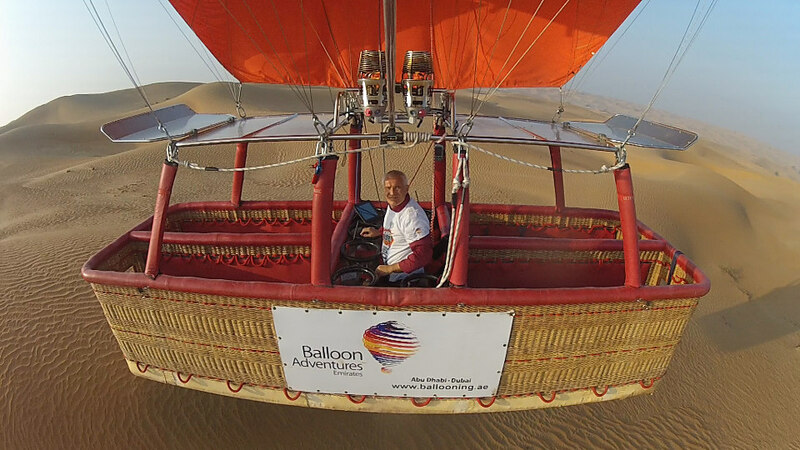 The balloon reached 11129 feet of maximum altitude at 07:21:49. Dropped the remaining guys one by one, Mike being the last one. His last words were: “Are you sure you will be OK?” I think that he jumped before I could utter a meaningful answer. And then came a moment of Zen. Floating high up in an empty 500. An unusual mix of euphoria and “how the hell do I get down from here”. In fact nothing could have been easier. I just let the balloon descend, hardly using the “candy stripe line”. The lowest temperature I reached just before landing was 46.5 degrees. The only problem was, from a navigational point of view, that there was only a sea of sand between me and the Oman border, which I dared not to cross. Eventually I ended up landing in perfect conditions of 4 knots on a reasonable track in the middle of the Dubai Desert Conservation Reserve (a national park). Thanks to my indispensable Ipad, I knew exactly where I was and could direct the crew to me. Previous postRomantic Weekend near Rome? Umbria is just perfect!